Heat oven to 375°F. In large saucepan, bring water to a boil. Add rutabaga; return to a boil. Cook 2 minutes. Drain thoroughly. Place beef roast in ungreased shallow roasting pan. Arrange rutabagas, cabbage and onion around roast. 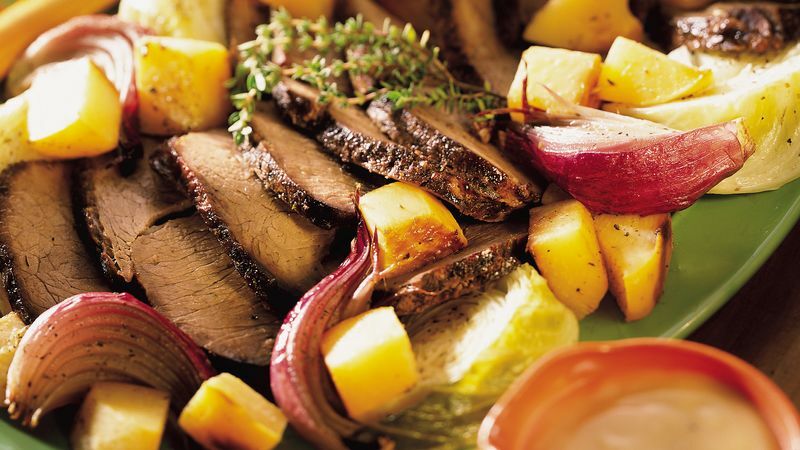 Brush roast and vegetables with olive oil; sprinkle with salt, thyme, marjoram and pepper. Spray sheet of foil with nonstick cooking spray. Cover pan tightly with sprayed foil. Bake at 375°F. for 1 hour. Uncover pan; place meat thermometer in roast. Bake uncovered for an additional 30 to 45 minutes or until roast is of desired doneness (meat thermometer registers 145 to 165°F.) and vegetables are tender. Remove roast and vegetables from pan; place on serving platter. Cover to keep warm. In medium saucepan, combine broth and flour; mix until smooth. Add drippings from roasting pan, scraping up any brown bits from pan. Add mustard and jelly. Cook over medium heat until mixture boils and thickens, stirring constantly. Serve gravy with roast and vegetables.